A figure sits upright in bed, her face covered with her hands. Above her, in the dark, hovers nine swords. Her legs are covered with a quilt that is decorated with red roses as well as the zodiac & other planetary symbols. The wooden bed has a carving of two figures, one on the attack and another on the defence. This is a card that conjures images of nightmares and fears. However, the swords that are suspended in the air above the figure suggests that these fears are all still “up in the air” nothing is concrete or solid yet. Perhaps many of the fears that cause her sleepless nights are conjured and not quite based in reality. However, be that as it may, fear itself is a very real thing, as most of us are only too aware. The roses motif on the quilt as well as the planetary and zodiac symbols speaks of secrets, and in this case the secret lies in knowing what our strengths and weaknesses are, for in doing so we learn about who we are. Once we understand our weaknesses we are better equipped to take practical steps to address these, and in some cases we are even able to turn a former weakness into a strength. 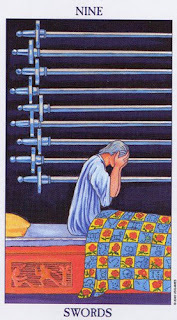 In the card the fearful figure sits in darkness, as she imagines all these swords above her. It is therefore necessary for us to move from the darkness of the unknown by admitting our weaknesses so that we are able to turn them into strengths or at least so that we are better prepared when faced with challenges. An honest self-examination is needed where aspects of ourselves that were formerly in the dark or a “secret” can be revealed and dealt with appropriately. Once we know ourselves we can cast a light on things that were previously in the dark, and gain clarity and understanding. In the light things seem a lot less threatening than what they can seem to be in the dark. The two figures carved into the bed further reinforce the need for us to choose whether we will allow our fears to dominate us, or whether we will dominate our fears instead. If we allow our fears to rule us while we are shrouded in darkness we will surely succumb to our nightmares. Instead, we could be the other figure in the carving that is proactive and dominant, the figure that represents having overcome his fears and faced his weaknesses along with his strengths by throwing the cover of secrets off and closely examining himself with honesty and courage. The astrological symbols on the quilt shows us that there are many aspects to ourselves that we still need to discover and understand. But, in understanding these lies the comfort of self-knowledge and preparedness. Just like a warm quilt offers comfort and shelter on a cold evening, self-knowledge offers clarity and the comfort of confidence in our abilities to face challenges that may come our way. But most importantly, by learning who we are, we dispel illusions that can create darkness around us so that we are always surrounded by the light of knowledge. It is then less likely that we will have sleepless nights, conjuring fears based on the unknown that can torment us and cause us to become fearful and weak. Once we have eliminated the dark and seen that there are no swords hanging above our heads, we can relax and get a good night’s rest knowing that we are well equipped with self-knowledge of our strengths and weaknesses. It is then that we can draw the quilt of comfort over us as we prepare to rest.